Several Bering Sea storms have hit the coast of Southwest Alaska hard this past week. 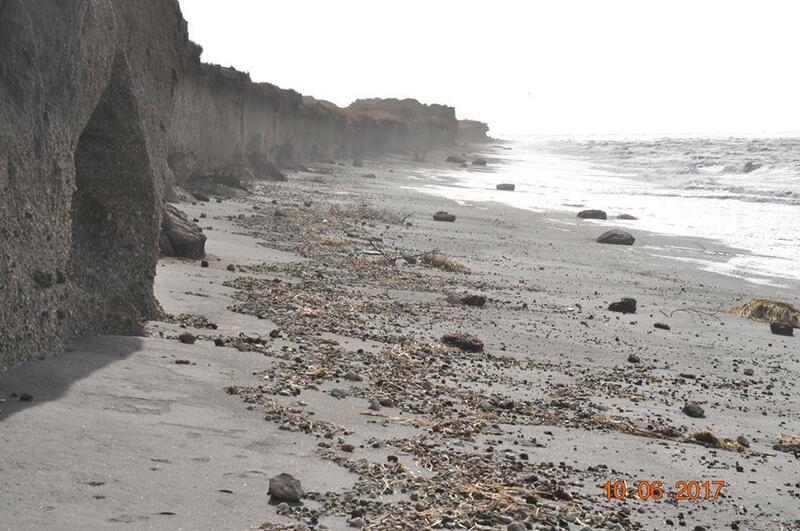 For the village of Port Heiden on the Alaska Peninsula, that has meant accelerated erosion, an issue the village has been dealing with for years. Trained monitors in the village measured six feet of erosion in some places from the most recent storms. Within the last year, they have measured twenty to one hundred feet of erosion along different sections of their coast line. Jaclyn Christensen is the village brownfield coordinator. She said the shoreline seems to be eroding more quickly than it used to. It’s a fight Port Heiden has been waging for decades, to stay above water. They started building homes on higher ground away from Meshik, the old village site, in the 1980s. The last person moved out of the old village in 2008. But the solution is not as simple as abandoning the old town. First there’s the issue of what to do about the old buildings. Left alone, they would be washed into the sea and the debris will end up on Port Heiden’s beaches. Last year, before the road washed away too much to drive heavy machinery on it, the village deconstructed most of the buildings. Then there’s the loss of safe harbor. John Christensen Jr. is the tribal council president and a commercial fisherman. Finally there’s the continued erosion, even in the new town. While the homes where people live now, the village office and the village store are currently on stable ground, to get from the bluffs where the town lies to the beach where barges land and residents subsistence fish, the village has to regularly reconstruct beach access roads with a loader. More worrisome, erosion is getting to the roads near the school. Port Heiden’s fuel tank farm was relocated fewer than two years ago due to erosion concerns. But Jaclyn worries that its new position by the school might not keep it safe from erosion for long. Even as the village continues its march inland, she said that there isn’t a lot of talk about why the erosion is happening. “We don’t really use the word “climate change” around here,” Jaclyn said. “We just know things are changing. We just know high winds are becoming more frequent. We know that bad weather is hanging around a lot longer. I don’t really hear the elders or the local people talk about climate change or ocean acidification, or global warming as much because it seems like a foreign factor that we’ve never really had to understand before. Whatever the cause, Jaclyn Christensen is optimistic that the community will stay motivated and find solutions.